A most blessed Easter to those celebrating the Risen Lord Jesus today! 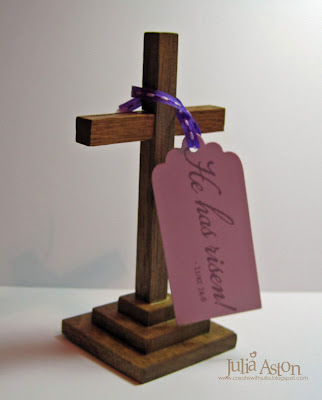 I wanted to share with you this wonderful wooden cross that my husband made for me. My sister and I each had a cross like this that our father bought us at our church fair one year when we were small. 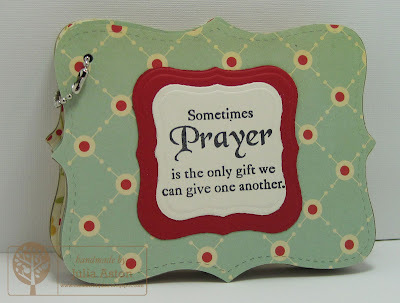 We had them on a table between our twin beds and kneeled in front of them to say our prayers at night. When I found mine in a box in the attic recently, I asked Kent if he might be able to copy it and make me some to give to the people in my Bible Study Group at church and he made me about 50 of them! 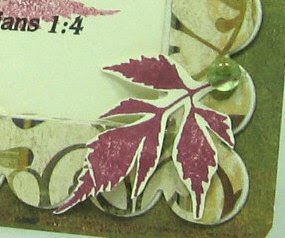 I cut this Spellbinders tag and stamped it with a verse from The Gospel of Luke 24:6 and draped it around the cross. So appropriate for the Easter Season! 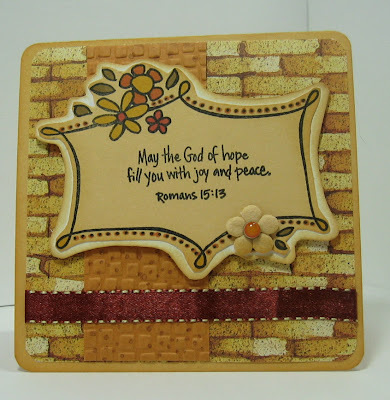 Accessories: Spellbinders tag, hole punch, ribbon, wooden cross. 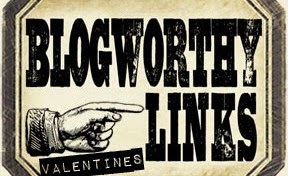 A quick Note! 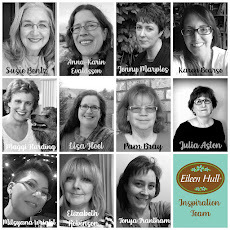 They have extended the deadline to sign up for the Stamping Around Weekend in Farmington CT - so if you want to get in on this super fun stamping weekend see more info and sign up here! 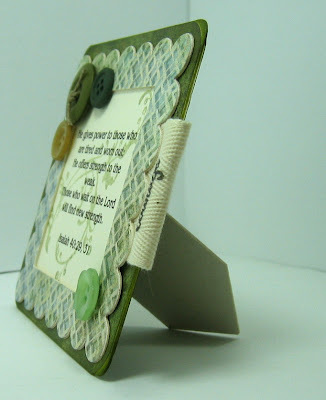 I made this little book of Bible Verses to give to an Interim Assistant Pastor who is leaving our church this Sunday. During his year with us he ran a weekly Bible Study group that I particpated in. 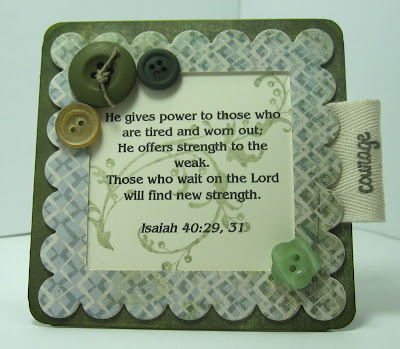 I wanted to give him something to remind him of our spiritual time together - so I found verses about prayer as well as discerning God's path for us. He is semi retiring and looking for a part time pastor position in VA where his family is from so he really doesn't know what will happen next for him and his wife. And this is a picture of our church (that my father drew for the church many years ago so it's really special to me) that I put on the last page so Fr. Charles will remember his time with us whenever he takes out this little book. 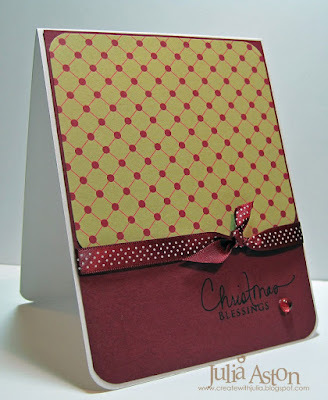 I cut out the pages from cardboard with the Top Note die from Stampin Up - then cut out pieces of designer paper with the same die and attached it to all of the cardboard pages - front and back. The verses are computer generated and printed onto Vintage Cream. I cut them out and attached them over the designer paper. 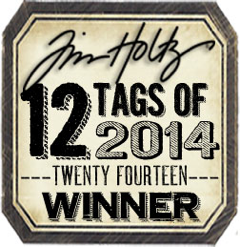 I punched holes in the top left corner of each page with my Crop a Dile and put a silver chain through the holes. You could add flowers or other accessories to each page as well as the cover - but I wanted the verses to be the focus so I left it all plain. I think the designer paper has enough color and design on it to make it nice to look at. 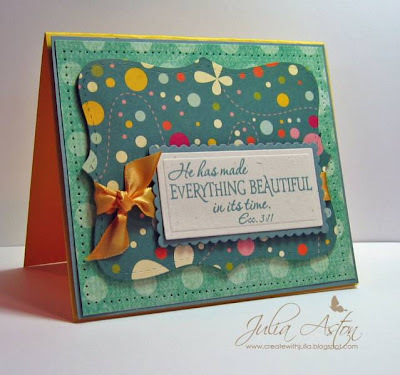 The cover stamp is by The Stamp Pad Co and I used Labels One Nestabilities to frame it. remember to check out Stamping Around if you are in the Connecticut/New England area! Stamps: The Stamp Pad Co. Accessories: SU: Top Note Die, Tandy Leather: chain, Crop a Dile, Nestabilities: Labels One, computer generated verses. 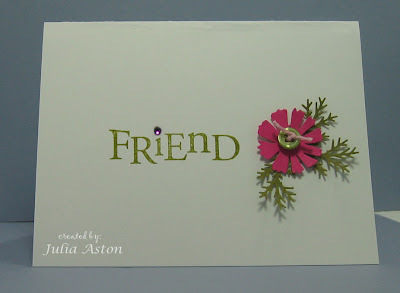 I loved the white embossing on her card - but I don't have the stamp set she used (can you believe there is a stamp I don't have???! Shocking - I know!! LOL!!) - so I substituted the Bird Call cuttlebug folder which has similar lines. First I inked the inside of the front of the folder with First Snow Ink by Papertrey - put the card stock in the folder and ran it through the cuttlebug. I love the look that this technique gives. I cleaned off my folder immediately after embossing. 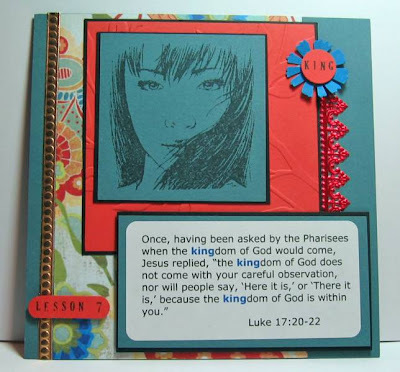 I added a second blue shade of color to my card by using the Blue Bayou for the Bible Verse (Verve Visual) and the framing of the cuttled panel. 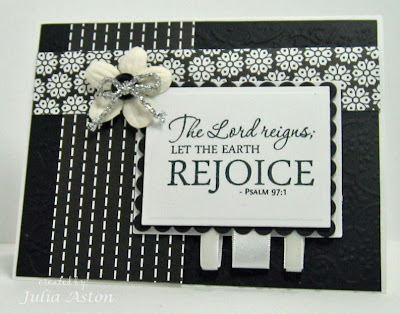 I did emboss the sentiment using Versamark embossing ink and white embossing powder. 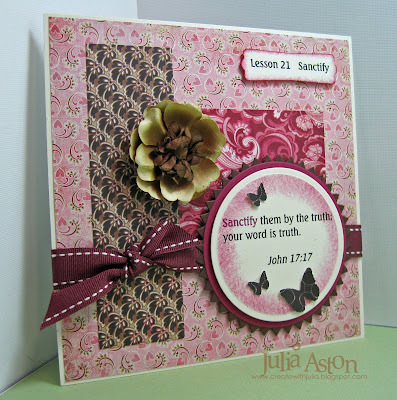 The butterfly was punched out of Glitter card stock using a Martha Stewart punch. 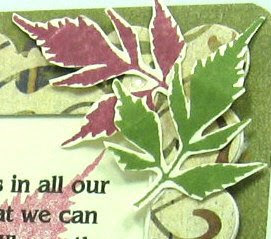 I attached it to the card with a glue dot. I really like how the cuttled panel came out on this using the ink. 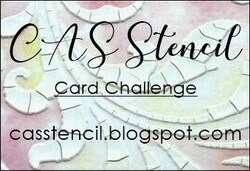 Today's Clean and Simple (CAS) challenge on Split Coast was to use piercing or drawn dots on your card to highlight the image. In keeping with the 'less is more' idea of Clean and Simple cards - I simply stamped this egg on a white square, mounted it to a plum pudding square (I know - it looks black in the picture - the trials of night time photo shooting!) 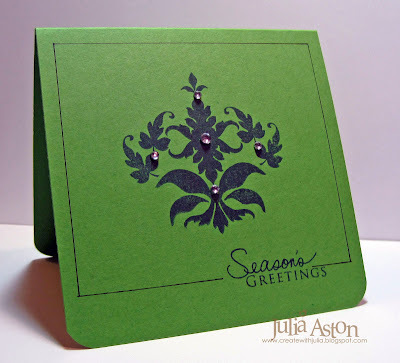 mounted that to the card - stamped the sentiment underneath the image and then used my Stampin Up grid, mat and piercer to add the lines of piercing. 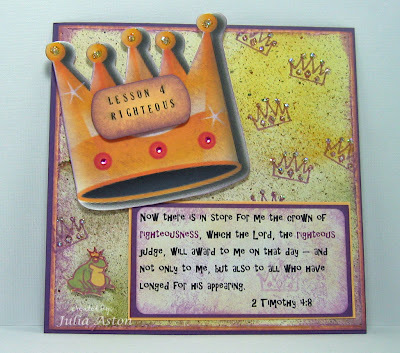 The card looks simple - but I went through 3 colors and 3 different stamps before I got the combination that looked good to me!! And I do like how the piercing looks on this! 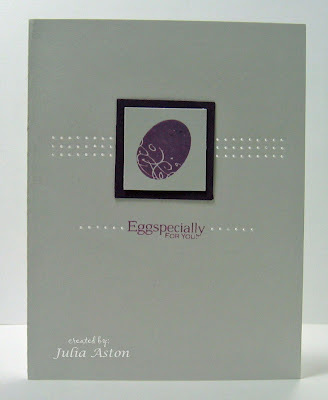 This pretty egg and coordinating sentiment are from a new H&M Stamp Set called Eggstraspecial. It's one of Heather's 3 new sets so be sure to check it out! We had about 7" of new snow today - mostly during morning commute - oh joy! 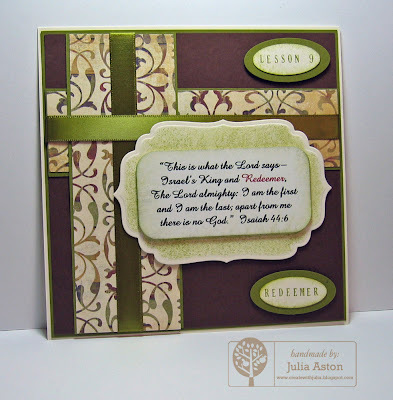 I've been meaning to join the Monthly Divine Design Bible Verse Challenge over on Split Coast ever since I read the thread there. 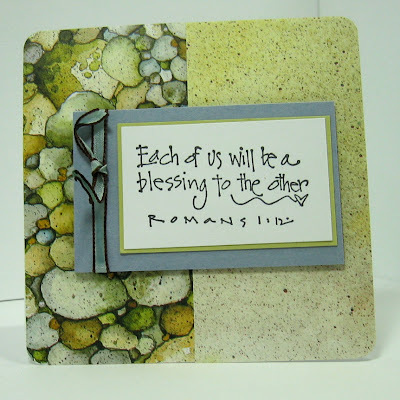 The challenge is to make a card with a Bible Quote on it each month. I finally sat down this weekend and created cards for January through April and will continue making one a month for the year. This verse from Romans reminds us that God's grace makes our lives better if we just let him into our hearts. 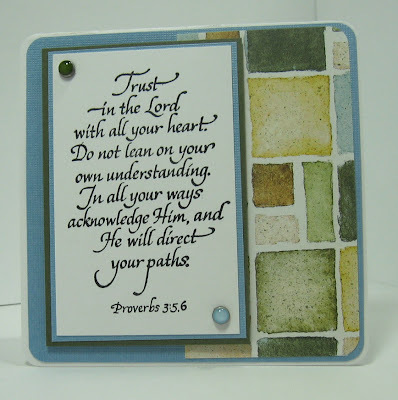 I used designer paper from a Provo Craft Scrap Pad called River Rock that has great nature/natural color designs in it that I thought would complement God's words. I used it on all 4 of these cards. 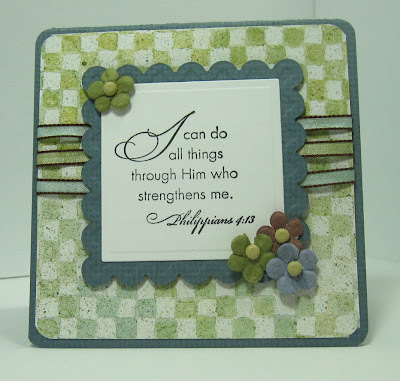 All my cards are the small 4 1/2 x 4 1/2 size so that the Bible quote is the main focus of the card and any flowers, ribbons, or other attachments just serve to highlight the verse. 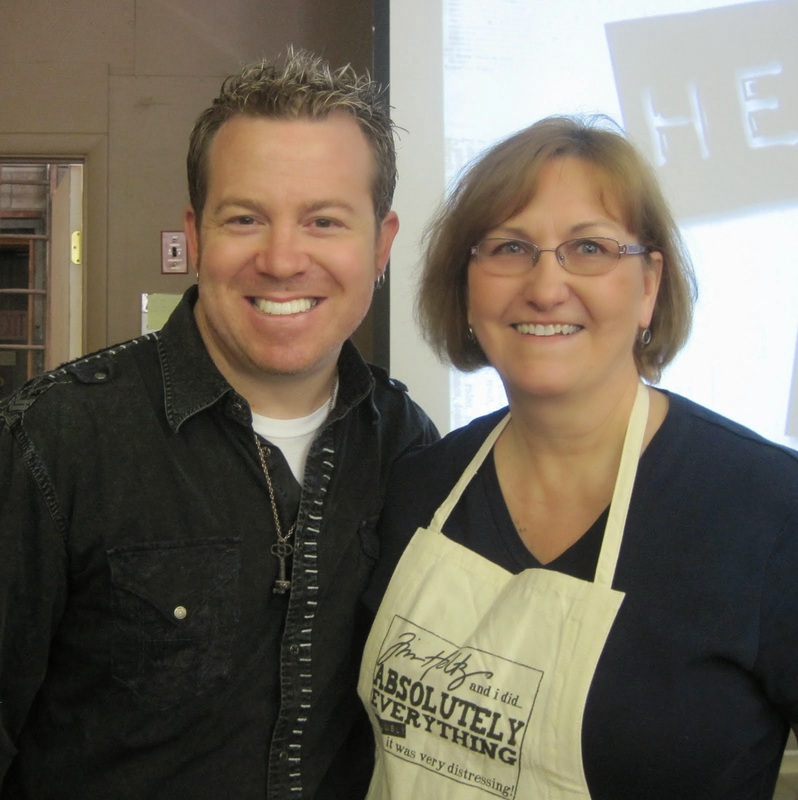 Thank you Lori for this wonderful challenge that will remind us all year long of the power and grace God brings to our lives. 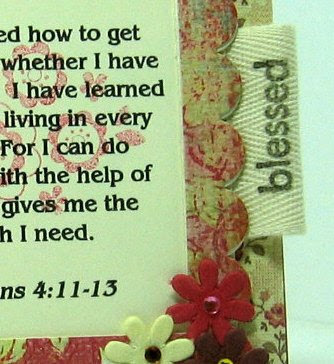 I love this verse from Romans - I use it alot for cards I send to people who need support from prayer as well as from their friends. It reminds me of God's most important commandment: Do unto others as we would have them do unto us. I need to be mindful that God works through me. We are his presence on earth. I used my hot gun to curl the ends of the ribbon. This verse from Proverbs reminds me that I need to trust that God is always there to direct me - that I don't always know what is best! 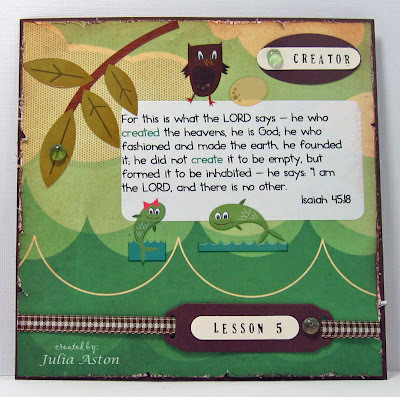 I thought this designer paper looked like the path referenced in the verse. 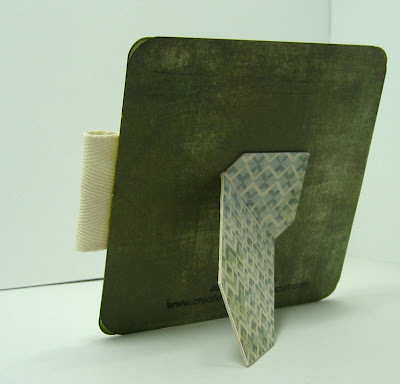 Accessories: Corner Rounder, Dimensionals, green & Blue glass brads. And here is my April Card - finally caught up! I love this verse from Phillipians. It reminds me that with God in my heart I can get through anything that life throws at me. 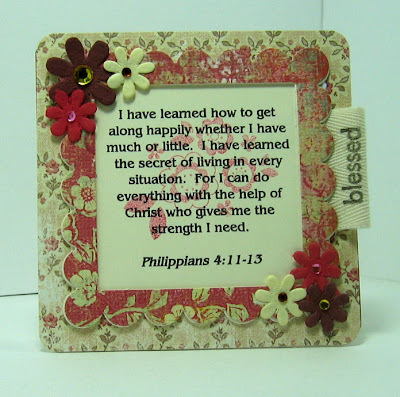 I used my nestabilities to cut the frames and put three ribbons to symbolize the Trinity behind the verse. 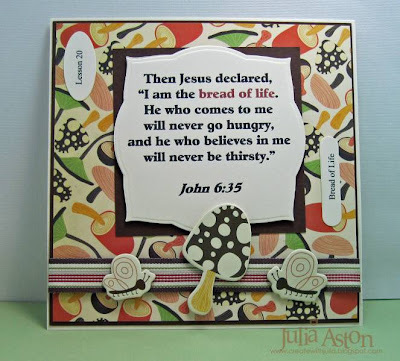 I'll be posting a Bible Verse card on the 8th of each month from now on. So please check back to see my new additions. 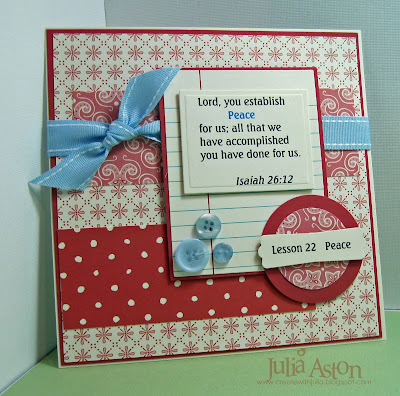 I hope these Bible verse cards have been an inspiration for you!